The TEE-1435 track gauge has been developed for track and switch geometry measurements. The trolley offers all functions of the TEC-1435 track gauge and, in addition, makes it possible to make measurements of all geometrical parameters of switches included in the pertinent regulations. The measurement results are registered continuously along the measurement path and, moreover, one can in addition make readings of the parameters at the user-defined switch characteristic points. 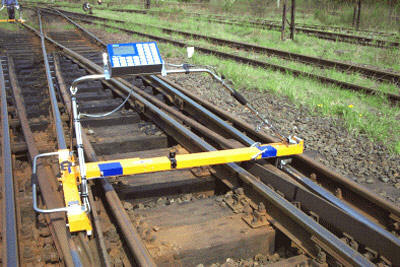 System software of the track gauge controls the integrity of all measurements made for the particular switch type. Measurement system calculates twist of the track, gradient of the track gauge, twist of the switch, and location of the left and right check rails. The PC software delivered along with the device makes it possible, among others, in addition to options offered by the TEC-1435 device, generating the detailed measurement reports for the switches. Switch condition quality assessment is also carried out. The gauge has many operational advantages. Low weight (about 20 kg) makes fast removal from the track possible to let the train pass, next, immediate continuation of the measurements is possible without any calibration. The track gauge may be folded easily and transported even in a small car. Switch condition assessment can be done by using measurement data at characteristic points, specified in the leaflets. However, real life experience calls for more detailed information - that can be obtained by continuous measurement of the switch geometrical parameters like in plain track. It happens that a switch - apparently in a good shape - is no longer considered as such when its geometry is measured in more detail - every ca 30 mm. The plots below show the continuous measurement results of a switch. Please note the ribbon plot at the screen bottom - it is a summary switch geometry assessment made automatically by the system. The user is free to select geometrical parameters and their tolerances that will be taken into account for the quality evaluation. Tolerances for any parameter may vary for different switch zones, such detailed specifications can be named and saved by the user. Two screens below show measurement results for two different routes through the switch. The main goal of the TEE-1435 software is to assist in generating the measurement reports for the assessment of the geometrical switch quality level. The switch quality is evaluated using the synthetic switch quality coefficients in a 1-10 scale, and is presented in a concise Measurement Reports (PDF file - 158 KB).